Lepidodactylus lugubris consists of many unisexual lineages. The all-female populations reproduce by parthenogenesis = The females are capable to produce young without male fertilization. There is only little genetic variation among individuals within a lineage but a relatively large amount of variation among lineages (Hanley et al., 1994). Ineich (1988) described a bisexual lineage but later investigations demonstrated that these are a separate species (Hanley / Bolger / Case, 1994). The origin of Lepidodactylus lugubris most likely is Arno Atoll, Marshall Islands (Radtkey et al, 1995). On many island groups only a few clones were found. height: approx. 62 and. 74,6 m), were shown to have 1 diploid clone and a total of no less than 11 triploid clones, which moreover except for one (clone B) all appeared to be endemic to this island group (Yamashiro / Toda / Ota, 2000). 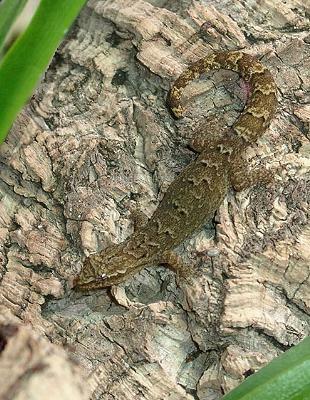 Lepidodactylus lugubris is very adaptable. Henkel / Schmidt (1991) indicate that lepidodaytlyus lugubris was kept in modified plastic boxes at laboratories for a several generations. Suitable temperatures, hiding places and adequate amounts of food are most important. In the wild they mostly live on trees and are found in areas near beaches as well as in deep rain forest, within mangroves, on palm trees and in human habitations. At night they were observed hunting insects around lights (Sengoku, 1998; Nietzke, 1998), also alongside Hemidactylus frenatus (Green / Turner, 1996; Brown / O' Brian, 1993). Nietzke (1998) mentions that Lepidodactylus lugubris observed in Central America turned out always to stay in "relatively the same territory" and to have a "relatively large action radius". In many places with growing city areas Lepidodactylus lugubris meanwhile is replaced by the asiatic house gecko (Hemidactylus frenatus). Petren, Bolger and Case (1993) tried to find the reason for this by a study, in which former hangars were rebuild and occupied by both gecko species. Under city conditions the insects concentrated at lighted areas which were successfully occupied by Hemidactylus frenatus and the number of Lepidodactylus lugubris significantly decreased. This success resulted mostly from an avoidance response of subordinate Lepidodactylus lugubris rather than over aggression by the house geckos. As a further advantage for the house geckos turned out that they recognized their prey from far and traced it more intensively than the mourning geckos. Observations of McCroid / Hensley (1993) in the Territory of Guam indicate that Hemidactylus frenatus consumes hatchlings and juveniles of Lepidodactylus lugubris. The lineages of Lepidodactylus lugubris vary in ground color, pattern and size. They can be distinguished by dorsal color pattern (Ineich 1987, 1988). For some more detailed descriptions see Lineages. The geckos can reach a total length of approx. 8-10 cm (Seufer, 1995: 8 cm; Nietzke, 1998: 8-9 cm; Henkel / Schmidt, 1991: 9 cm; Rösler, 1995: 9-10 cm). The tail is laterally somewhat serrated. The toes carry adhesive lamellae. There is only little genetic variation among individuals within a lineage. In my own geckos I only can determine singly specimens by their size. They all show the same pattern and both, coloration and visibility of pattern, may change extremely depending on temperature, mood and colour of immediate surroundings. light ground color with dark spots from the neck to the tail-base. dark brown/dark reddish brown/gray brown with darker bands. The underside is colored lighter (white or yellow). These color changes may occur independend from temperature, too. Sometimes I also observed a beautiful soft yellow coloration. After a longer stay in a dark hiding place they look very pale and somewhat transparent. 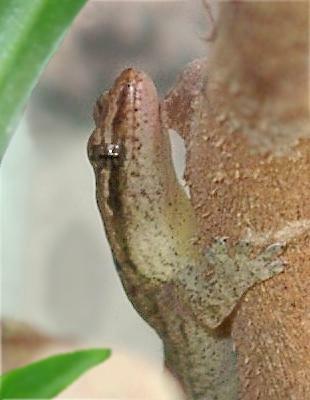 The flanks of my juvenile geckos are, as also mentioned by Nietzke (1998), perhaps depending on mood temporary colored darker. Their call is not unlike a "click", which in the younger geckos sounds like suppressed sneezing. In "male" geckos the call is more dominant (Rösler, 1992). Susan G. Brown and Susan Murphy-Walker (1996) describe it as a "multiple chirp call". The geckos are more territorial than females of other gecko species but their actions are not performed as intensively as by male geckos anyway. Werner (1980) reported female, holding an other down with a bite for a several minutes. He finally assumed this apparently homosexual behaviour to be a rank or territory stuggle. "The beta female, after laying eggs during the night, challenged the alpha female repeatedly during the day. Both geckos repeatedly bit each other on the neck and tail regions holding the bites for extended periods of time. The next day the beta female was observed displacing the alpha female; the beta female remained dominant for the remainder of the study." On the whole the dominance hierarchies were stable and interactions between the geckos decreased (Brown and O' Brian, 1992). The interactions I observed in my own geckos are mostly friendly. Sometimes the geckos arch their back and walk crosswise, but they mostly only "click" to each other. Very seldom they chase each other and vanquished geckos do not seem to be pychologically affected. Fights are extremely sheldom and only occur between my biggest geckos. 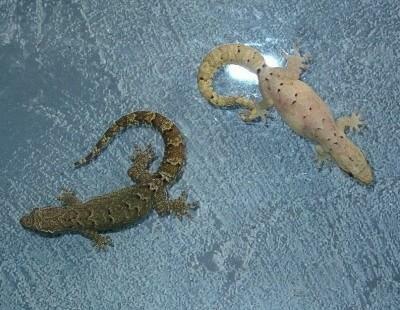 I never noticed fights between smaller geckos or geckos differing form each other in size. Usually the next day fights are over and the hierarchies are stable for the next months. 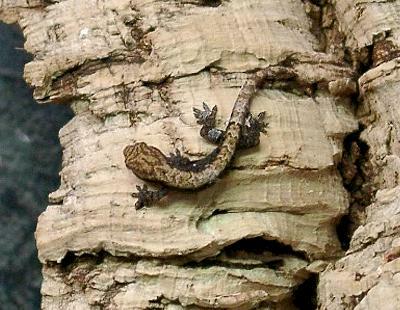 At their favourite places the geckos often are resting relatively close to each other. Sometimes they even climb over each other, but this certainly by mistake. 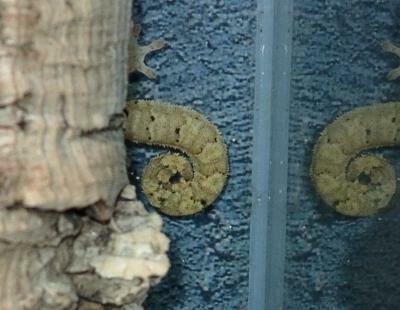 When approaching their prey the geckos wag their tail as cats do. It also looks very cat-like when they are "washing" their feet. If water is sprayed the geckos start darting their tongue in and out. Sometimes they also lick over their eyes. When sleeping they roll up their tail. Their movements mostly are a slow climbing or an extremely fast stage by stage sprint. 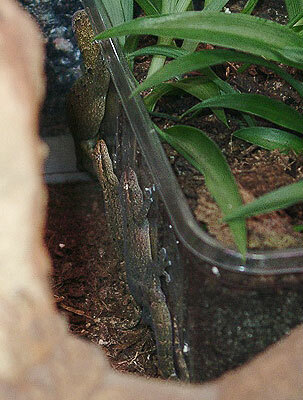 The geckos also like jumping through the terrarium from above. 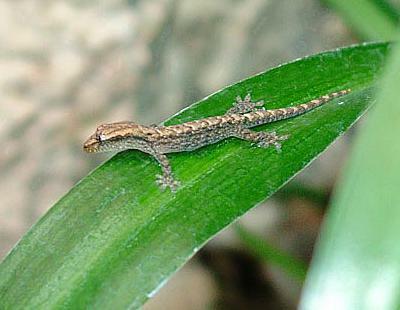 Young geckos are active at night and day, adult geckos mainly at night. But there are also reports of Lepidodactylus lugubris observed at day: Green and Turner (1996) on two occassions observed Lepidodactylus lugubris moving around during daylight hours in partly shaded open situations in Australia, Daintree Region. Wilson and Knowles (1988) even comment that the species was often observed foraging by day in sheltered positions or basking in weak sunlight. In the terrarium my geckos are very lazy at daylight, some resting in hiding places, others resting at the terrarium wall, on plants, branches or on a stone at the bottom. If there is a piece of banana in the terrarium they often get active also during the day for nibbling a bit. Availability of sweet food influences the activity patterns of Lepidodactylus lugubris not only under terrarium conditions. On Guam while the coconut trees (cocos nucifera) were in blossom mourning geckos were repeatedly observed during the day while licking nectar at the inflorescences (Perry / Ritter, 1999). Sometimes more than 10 geckos of various sizes and color morphs were found on a single inflorescence. The geckos occasionally fed on the insects that were also attracted to the blooms but mostly ignored them. On palms which had no nectar on their flowers but also attracted many insects no geckos were found during the day. 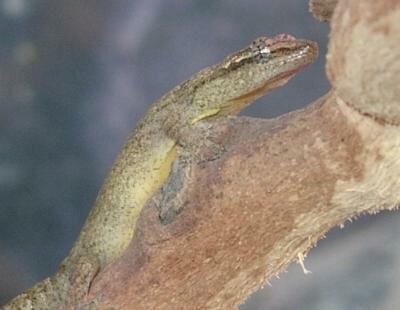 As large numbers of Lepidodactylus lugubris occupy flowering cocos nucifera and other species of flowering plants emanating nectar it is quite possible that the plants benefit from the geckos by pollination (Perry / Ritter, 1999). Brown and Walker (1996) reported a sterile male which reached an age of approx. 5 years in captivity.